Paratroopers of Russia's 98th Guards Airborne Division from Kostroma-based 331st Guards Airborne Regiment captured near the village of Dzerkalne on 24 August 2014. Credit: Hromadske. 29 August 2014, Kyiv. Russia has denied its involvement in the war in the East-Ukrainian region of the Donbas it had brewed up back in 2014 and keeps fueling today. Kyiv states that Russian regular military detachments took part in the fighting on Ukrainian soil, aside from the paramilitary formations Russia created locally in Luhansk and Donetsk. From the beginning of the war, Ukrainian forces took prisoner a few dozens of active service soldiers from Russia, apart from multiple locals and Russian nationals who fought against Ukraine. Most of them were exchanged for Ukrainian captives. By stating that its captured regulars either had left military service or been on vacation, Russia deprived them of their protection under the 1949 Geneva Convention relative to the treatment of prisoners of war (PoWs). So who are these PoWs and where are they now? Most of the Russian regulars were captured at the end of summer 2014 amid the large-scale Russian invasion. Then, an influx of Russian troops and weapons turned around the tide Kyiv’s successful Anti-Terrorist Operation, in which the Ukrainian military and law enforcers had nearly squashed a Russian-backed separatist paramilitary movement. After immense losses of the Ilovaisk operation, Ukraine and Russia had signed the Minsk Agreements, and two proxy republics, the “LNR” and “DNR” emerged. After the hottest part of the war in August 2014 – February 2015, no large-scale offensive operations took place and the regular formations of the Russian army were not involved that wide in WWI-style trench warfare, which still continues now. That’s why after 2014, Ukrainian forces captured only a few Russian active duty servicemen. 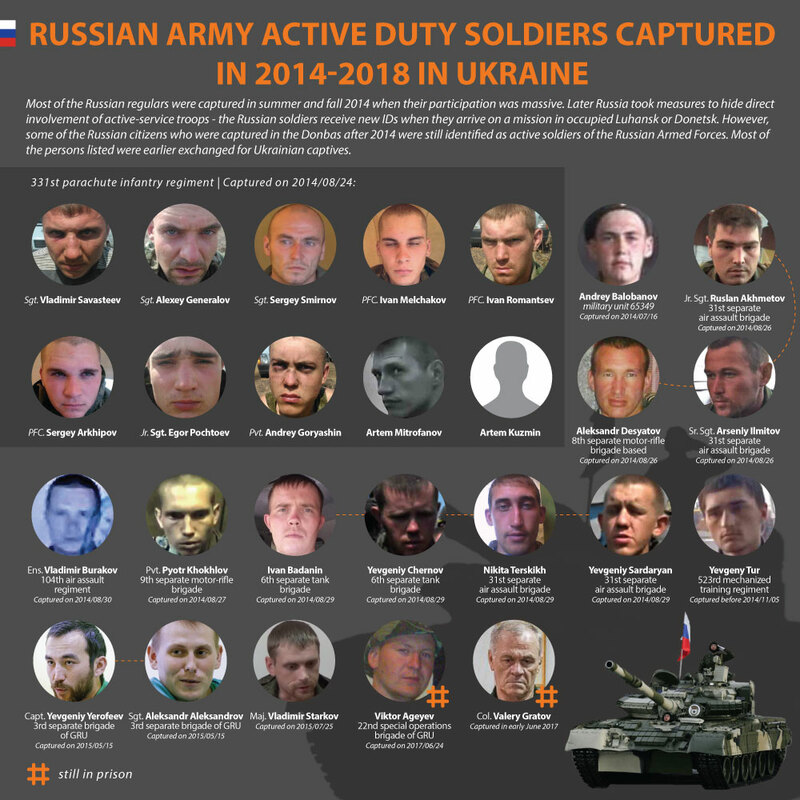 Russian active duty soldiers captured in Ukraine in 2014-2017. Open the high-resolution version. Infographic: Euromaidan Press. The first known Russian active-duty soldier captured in the Donbas was a 19-year-old Omsk native, conscript Andrey Balobanov, a communications specialist of the 7th motorized rifle company of the military unit 65349 (Central Military District of Russia’s ground forces ). He was taken around 16-17 July 2014 in the area of Marynivka, Donetsk Oblast by Ukrainian servicemen of the 51st separate mechanized brigade. It is unclear what happened to him later. In October 2014, Russia’s Investigative Committee opened a case against Balobanov charging him with defection. The latest media report on him emerged in November 2014, Balobanov ostensibly called his father on 5 November 2014 saying that he was safe and dwelled in a Russian military base in Moldova’s breakaway region of Transnistria and representatives of the military unit 65349 where he served were going to take him back to Russia from there. Artem Kuzmin, Artem Mitrofanov – their ranks were not reported. Note: Only 10 Omsk paratroopers are pictured, the tenth – Artem Kuzmin – was wounded thus he was immediately brought to a field hospital and later transported to Russia. The other nine prisoners were handed over to Russia on 31 August 2014. “This is the truth in fact. I am serious here. I believe that they did get lost because there is no demarcated border there. If military operations are underway or our servicemen are patrolling the border, this is entirely possible,” said Putin at a youth forum in Russia on 29 August 2014. “[According to the captured regulars,] they were sent to drills in the Rostov Oblast. Overnight from 23 to 24 August, they crossed the Ukrainian border. That morning, their detachment came under fire in a woodline three kilometers away from Kuteinykove [Ukraine]. Their airborne assault vehicle (BMD) was destroyed, one of them was lightly wounded, two more killed. As they lost their equipment and communications, they wandered searching for medical aid,” told Kozak. Senior Sergeant Arseniy Ilmitov from the same Russian 31st brigade. Aleksandr Desyatov (2013 photo from his social profile), near Ilovaisk he sustained multiple burns when his MT-LB was downed, thus in his photos in captivity he had a fully bandaged face. A few days later, on 29 August, Ukrainian Col. Mykhaylo Kovalskyi exchanged Ruslan Akhmetov for more than 60 Ukrainian PoWs, however, he was taken prisoner himself in the exchange and spent 10 days as a captive. 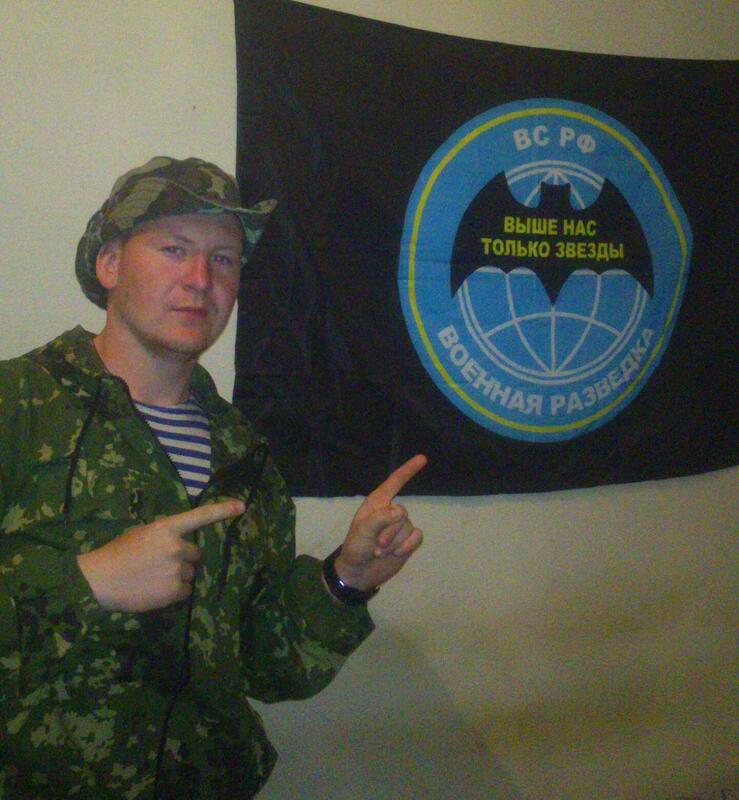 On 27 August 2014, the Security Service of Ukraine (SBU) captured Private Pyotr Khokhlov, a private soldier of Russia’s 9th separate motor-rifle brigade (based in Nizhniy Novgorod) in Luhansk Oblast. In his confession, he tells how his military unit was deployed to Rostov Oblast and then prepared to hand over Russian military equipment to “Donbas militants” – the serial numbers were removed from the vehicles and weapons. Khokhlov with his comrade-in-arms defected and crossed the Ukrainian border intending to enlist in the militia and receive 150,000 RUB a month (about $2,500 in late 2014). However, the first paramilitary they met in the occupied part of Ukraine detained them. Khokhlov describes how he was questioned by a number of “Russian officers” while in detainment in Novosvetlivka and Luhansk. Later, according to Khokhlov, he heard on the radio that an offensive started and was sent to the front, but was ambushed and detained by Ukrainian servicemen. Khokhlov’s unit wasn’t directly involved in fighting at the moment he defected, however, his confession sheds light on how the Russian paramilitary units were supplied by the Russian regular military formations from Russian territory. As well, he mentions the presence of Russian regular officers in Ukrainian territory. On 29 August 2014, the Ukrainian servicemen of the “Donbas” volunteer battalion captured four Russian regulars near the village of Chervonosilske in the area of Ilovaisk. Later, the SBU shared the video of them being questioned by the “Donbas” on the scene. The prisoners call what is supposed to be their names and numbers of their military units. Ukrainian OSINT sleuths disclosed their real identities by the social profiles of the servicemen and identified more of their comrades-in-arms who also participated in the invasion. A video filmed by the Ukrainian 80th airmobile brigade near the urban-type settlement of Heorhiivka, Luhansk Oblast on 30 August 2014 shows two Russian servicemen who were captured in a fuel truck which reached Ukrainian positions by mistake. The camera operator shows IDs of one of the PoWs – Ensign Vladimir Burakov (Russia’s 104th regiment of the 76th Guards Air Assault Division, Pskov Oblast), the second man wasn’t named. In the documentary “Cyborgs of Luhansk Airport,” Ukrainian soldier Andriy Kovalchuk who participated in capturing the two says that the second serviceman in the truck was an assistant company commander from the same detachment, though not naming him. No further details are available on Burakov and his comrade-in-arms, however, they are not among the Russian citizens who are on the exchange list now. Capt. Yevgeniy Yerofeev and Sgt. 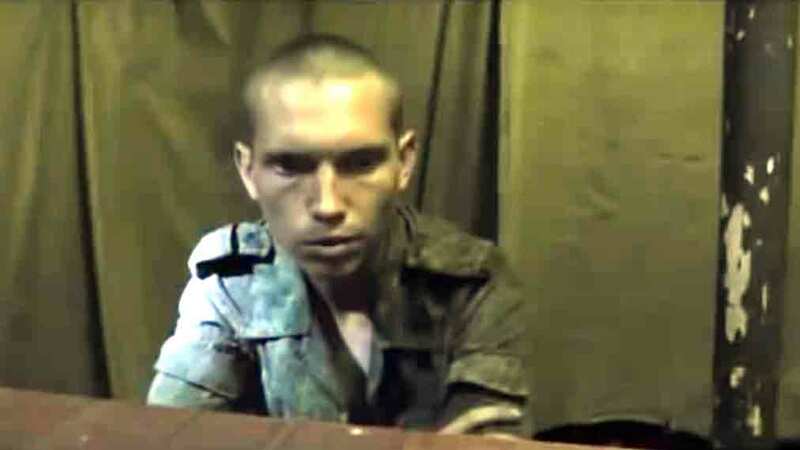 Aleksandr Aleksandrov from the 3rd separate brigade of GRU (Russian military intelligence) were captured in Luhansk Oblast near the town of Shchastia on 15 May 2015 in a battle in which they killed Ukrainian 92nd brigade’s Private Vadim Pugachov. Later both Russian operatives were exchanged on 25 May 2016 for First Lieutenant Nadiia Savchenko, who was captured near occupied Luhansk in June 2014 and illegally brought to Russia where a Russian court found Savchenko guilty of illegally crossing the Russian border and the murder of two Russian journalists. On 25 July 2015, Russian Maj. Vladimir Starkov transported a truck full of Russian-made ammunition from Donetsk to Dokuchaevsk – an occupied city lying 20 kilometers to the south from Donetsk. But it so happened that he missed his turn and came to Ukraine-controlled Berezove, where he was caught by border guards. He had only “DNR” documents under a false name, however, he immediately admitted that he was an active-duty Russian army major from the city of Novocherkassk. The so-called “12th Command” Starkov mentions is now known as the 8th Army, a Russian military structure made to control the armies of two Donbas pseudo states. The command of the Russian Armed Forces established it back in 2014 in Novocherkassk for conducting the hybrid war on Ukraine as the “12th Command of Reserve (KREZ) of the Southern Military District (military unit 89462).” In 2015, the formation was renamed as the Center of Territorial Troops (TsTV) of the Southern Military District (military unit 64722). Finally, in 2017 it became the Command of the 8th Army of the Armed Forces of the Russian Federation (military unit 33744). “No trip allowance is paid. You just officially get assigned to a post in the 12th Command in the city of Novocherkask, in such and such unit. And when you arrive there you face the fact that you will serve in ‘DNR’ and ‘LNR’,” says Starkov in the video. A Ukrainian court sentenced Starkov to 14 years in prison, however, by the end of the year he was pardoned and exchanged for a Ukrainian captive, Major Andrii Hrechanov, who had been in captivity for 10 months. On 24 June 2017 servicemen of Ukrainian 93rd brigade liquidated a subversive group near the small village of Zholobok in Luhansk Oblast and captured private first class Viktor Ageyev from the 22nd special operations brigade of GRU. 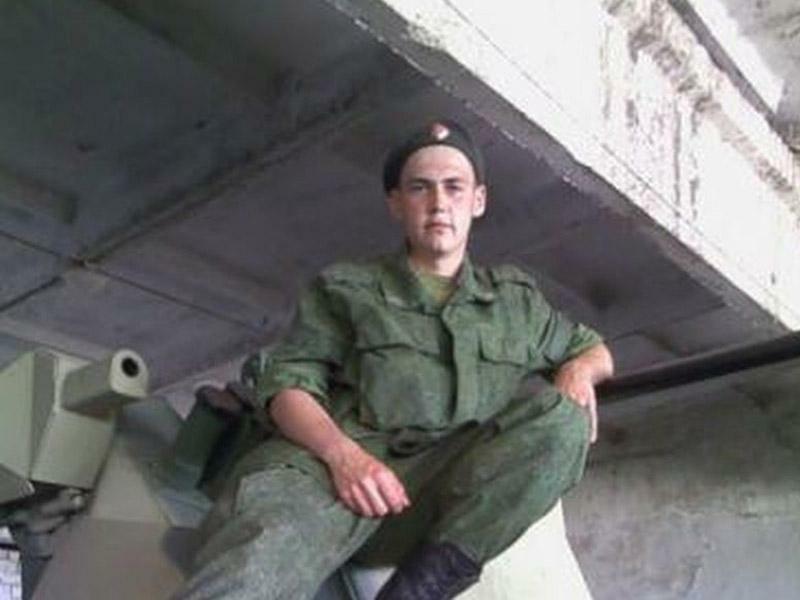 One more Russian serviceman, Aleksandr Shcherba, was killed in the battle, while Ageyev and the local pro-Russian paramilitaries were captured. 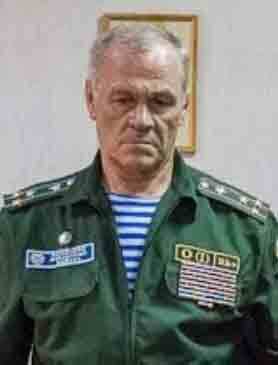 Ageyev’s mother Svitlana believed that he served in Rostov Oblast as a Russian contract soldier. In January 2018, the Novoaidar District Court sentenced Ageyev to 10 years in prison for being a member of a terrorist organization and for illegal possession of firearms. Colonel of the Russian Airborne troops Valery Gratov was detained by the Border Guard Service of Ukraine while he tried to cross the state border heading to the Russia-controlled Transnistrian region of Moldova. Gratov had been actively involved in activities of Russian occupational contingent in Donbas since 2014, according to Lysenko. Other Russian citizens captured by Ukrainian servicemen and law enforcers were either mercenaries fighting alongside the “LDNR” or suspected spies. Last summer, Ukraine was ready to exchange 36 Russian nationals for Ukrainians held in Russian prisons. However, as it emerged later, many participants of the list were clueless that they were offered for exchange and later many of them refused to be handed over to Russia. According to SBU, from February 2014 to February 2018, 145 Russian citizens were indicted on state-security related charges, 52 cases were submitted to courts (21 persons convicted). 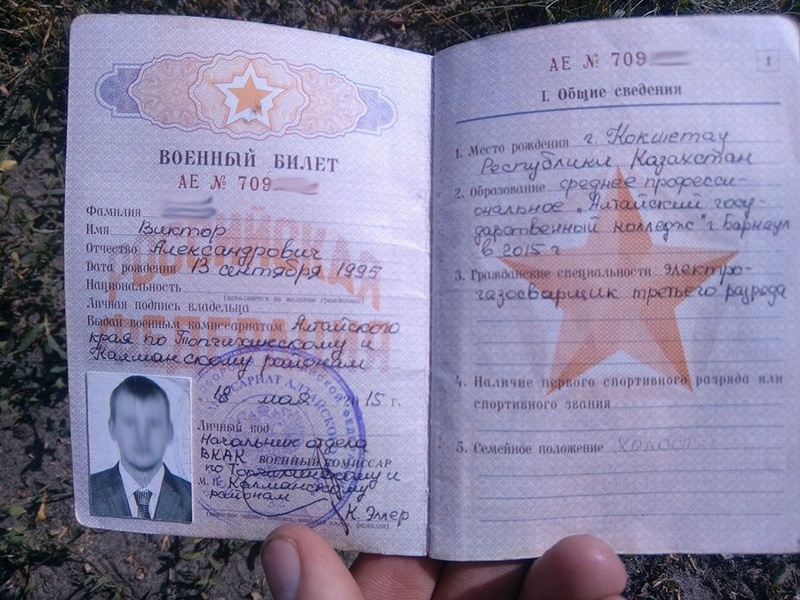 “After the group of paratroopers was captured back in 2014, all further Russian military servicemen who came to the Donbas had a stamp ‘deregistered’ in their military IDs, i.e. they were formally dismissed before their deployment and here in Ukrainian territory they acted as servicemen of ‘people’s militias’,” Ms. Reshetylova said. This statement is backed by the fact that major Starkov had a fake ID and disclosed his identity himself, hoping to meet a Russian consul in Ukraine.